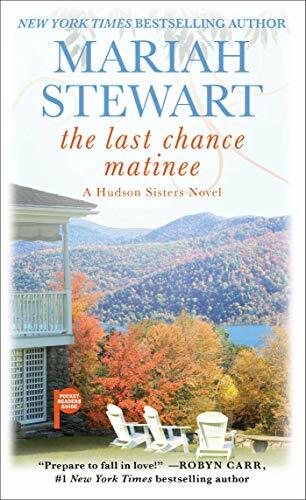 From New York Times, bestselling author Mariah Stewart comes the first novel in her all-new series, The Hudson Sisters, following a trio of reluctant sisters as they set out to fulfill their father’s dying wish. In the process, they find not only themselves, but the father they only thought they knew. The Last Chance Matinee starts off with a bang. The reader is introduced to Allie, an alcoholic, out of work television producer, Des, a former child star who now takes in foster dogs and helps with rescue organizations and Cara, a free-spirited yoga instructor who is still reeling from her divorce and the death of her father and mother. It is at the reading of a will that a bombshell is dropped, their father had two wives and two families. His East coast and West coast families and all 3 women are sisters. But what shocks them, even more, is the stipulation but on the will. Allie, Des, and Cara have to live in their father’s hometown and restore a theater. If any of the sisters leave before the renovation is complete, then none of them get their inheritance. I am going to say, I really liked this book and I really liked Fritz. He had such a huge presence in the book and he genuinely had his daughters’ best interests at heart…even if they didn’t think so. I kinda felt bad for him too. He was in a marriage that he felt that he couldn’t get out of and he made mistakes that he was trying to make up for in his last months. I think giving them the theater to restore was his way of getting them together so they could get to know each other. Allie, I couldn’t stand. She was such a witch with a b and she was so freaking negative. Listen, I totally get that she was upset when she found out about Cara but she was such a jerk to her afterward. I mean, Cara had nothing to do with the choices that her father made. Actually, she was a by-product of those decisions. I so wanted to yell that into the book. She was also very much so hung up on her ex-husband and I couldn’t believe that she started pumping her daughter, Nikki, for information about a woman that she suspected he was dating. Hello, they are divorced and he can date whoever he wants. Let’s also not forget her drinking. That is a huge problem. Oh, and she is very resentful of Des, too. Going back to when she was 12 and Des got her own TV show. The woman needs a therapist, stat. Des, however, I really liked. I actually connected with her on so many levels, it wasn’t even funny. She was very accepting of Cara and she dealt with Allie beautifully. She also had a passion for rescuing/fostering dogs which I really enjoyed reading about. She understood that her father wasn’t happy with her mother and she understood (well kinda understood) why he did what he did. Cara, I felt awful for. Her ex-husband left her for a very close friend, they are getting married and then she finds out that her father was a bigamist and she has 2 sisters. But she dealt with it graciously but she didn’t take anything from Allie about her mother being “the other woman”. She was a free spirit too, thanks to her hippie mother raising her that way (it isn’t a bad thing) with a wonderful outlook on life. I mean, she celebrated her ex getting married with a bottle of champagne with Joe….lol. There was a twist in the book that took me by surprise and it went beautifully with the end of the book. I honestly can’t wait to see what book 2 brings and to see if it lives up to book 1!!! Why: I enjoyed reading this book. It was fast-moving with characters that I could connect to. It would be a perfect beach/pool book. Why: Language. Otherwise, a pretty clean book. You’re welcome and I hope you enjoy it! !